Having trouble selling on social media? Are you trying to find the best way to pitch sales on the top social media platforms? Do you feel that every time you pitch a sale, you sound too “salesy”? Brock Johnson will provide you with the best tips and tricks for selling products on social media platforms (like Instagram, SnapChat, Facebook, etc.) today. Just like anything else, being a salesperson takes practice. Just get started and accept that it’s a bit awkward at first. Trust that it will get easier, especially if you apply Brock’s best tips! Selling is a concept lots of people feel icky about. That’s why Brock wants to share with you what he likes to keep in mind when he’s selling on social media. You need to learn how to feel more comfortable in your own skin when speaking in front of a camera, and feel less like a telemarketer. 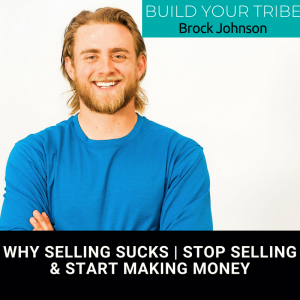 With Brock being new to selling as well, he truly understands what it feels like to make mistakes when pitching ideas or products. Even after practicing selling for a while, Brock admits that every once in a while he has the tendency to slip into a “salesy” voice when selling on social media. Sometimes, it’s easy to accidentally sound like your reading a script. But don’t let that set you back. The more you practice, the more you’ll develop your voice and build confidence. You can use Brock’s tips and strategies, and hopefully, you won’t have to do all the selling on your own either! Click here to subscribe to Build Your Tribe. If you liked this BYT episode with Brock Johnson, check out How to Stop the Scroll with Better Instagram Posts with Brock Johnson. Listen in to this episode and you’ll learn how to make your Instagram feed aesthetically pleasing. Because at the end of the day, a beautiful post matters.